Alex Nunez didn't get a hit in this shortened August 1990 game, but neither could opposing Burlington, according to Malamut.net. Nunez went 0 for 2 for single-A Kenosha that game. Other hits from his team gave Kenosha starter Tim Nedin enough to get his seven-inning no-hitter. Nunez ended up playing in five seasons as a pro. Hits ended up being part of his problem, too few of them. His career batting average for those five seasons was .199. Nunez' career began in 1988, signed by the Twins as a free agent out of his native Dominican Republic. 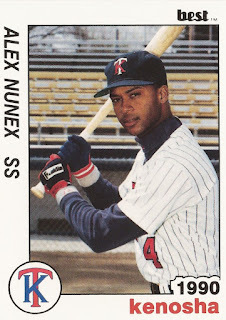 Nunez is also known by his formal name, Alejandro Nunez, and his name is misspelled Alex Nunex on his Best card. Nunez started at rookie Elizabethton. He hit just .151 in 31 games there. He then moved to the rookie Gulf Coast League in 1989, hitting .223 over 48 games that year. But he did steal 30 bases. 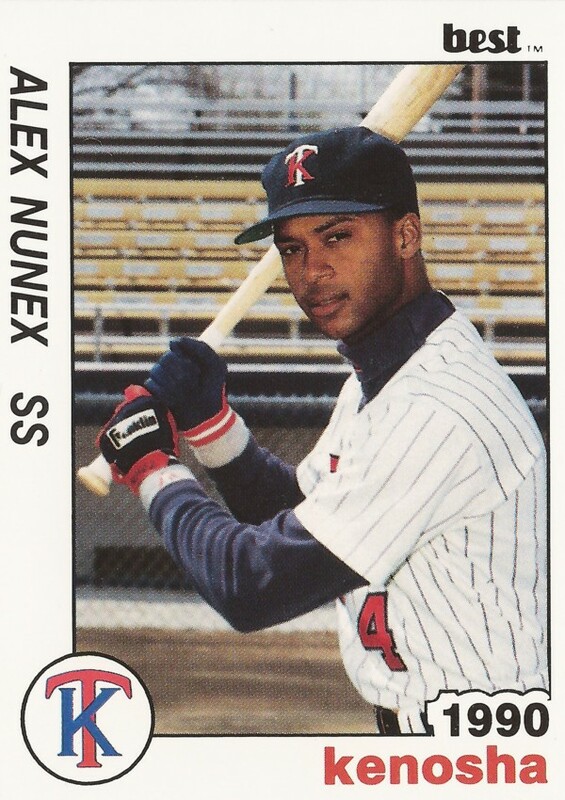 For 1990, Nunez played at Kenosha. In 117 games, the shortstop hit .197. He also hit no home runs and committed 42 errors. His stat line was enough to make a Philadelphia Inquirer dubious list of futile 1990 efforts. He also stole another 20 bases. Nunez played 1991 at high-A Visalia, but did little better. He knocked in 16 and stole 19. His final season came the next year, with high-A Fort Myers. In 34 games, he hit just .122, ending his career.